The LifeCHARGE Smart Lamp is more than just a lighting device. 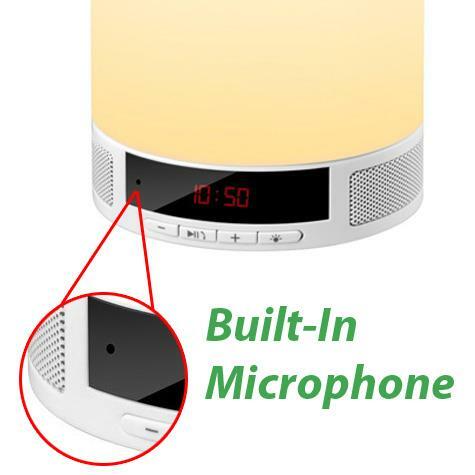 Its built-in Bluetooth speaker allows for connection with any Bluetooth-enabled device. That means you can answer and hang up your smartphone when connected with the LifeCHARGE Smart Lamp Speaker … completely hands free. You can also enjoy listening to your favorite music with crystal clear sound. 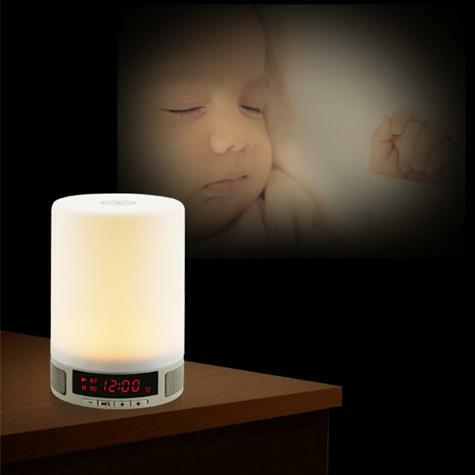 The LifeCHARGE Smart Lamp Speaker has a built-in alarm function. 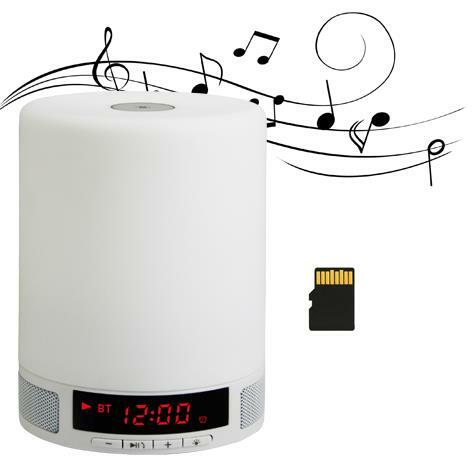 Choose your favorite song from your TF card and personalize your wake-up sound. 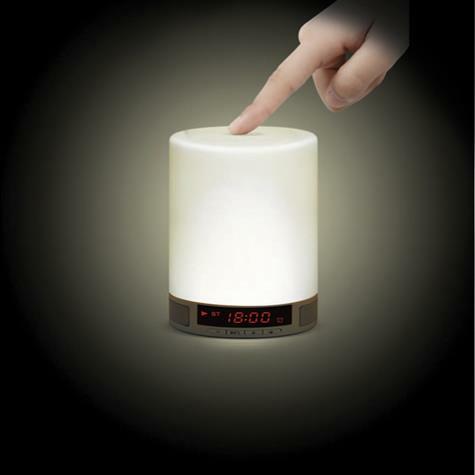 An LED clock function is part of the LifeCHARGE Smart Lamp Speaker’s design. Stop interrupting your Circadian rhythms with exposure to your smartphone’s bedside radiation. Know at a glance what time it is with a soft red display. 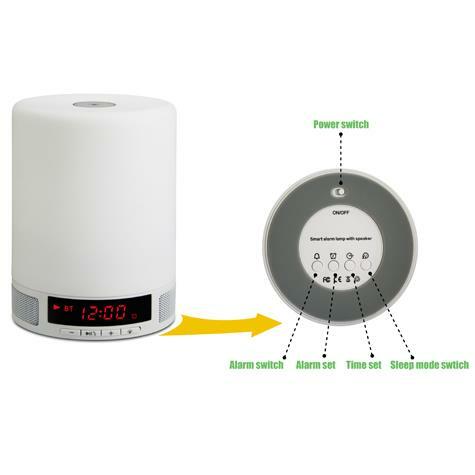 The LifeCHARGE Smart Lamp Speaker also features an integrated microphone that allows you to talk hands free on your connected smartphone. 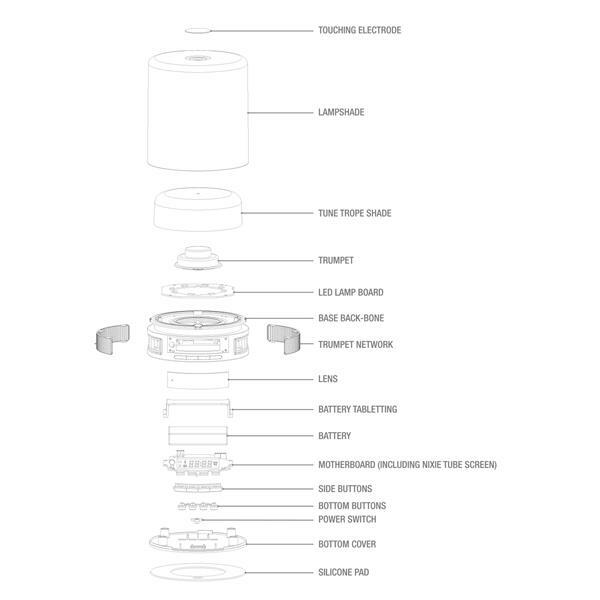 TransFlash (TF) Card slot allows you to add up to 16GB of extra storage to the LifeCHARGE Smart Lamp Speaker. Pre-load it with all your favorite music tunes and enjoy hours of extra listening entertainment. With simple touches, the LifeCHARGE Smart Lamp Speaker cycles through four levels of brightness. Dim enough at its lowest setting so as not to disturb a sleeping spouse or child, yet bright enough at its highest setting to allow for easy reading in complete darkness. Sky blue, red-orange, green, indigo, and violet, the LifeCHARGE Smart Lamp Speaker bathes your environs in the soft, warm glow of your favorite hue. Like variety? 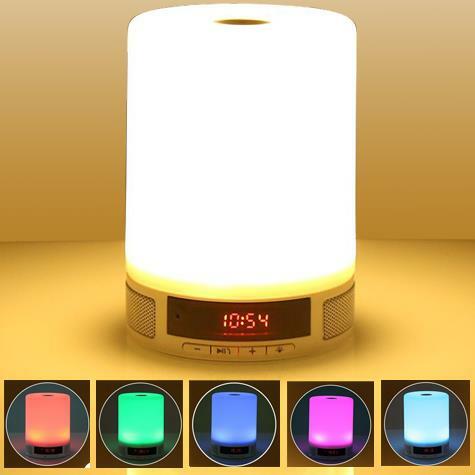 Then simply set theLifeCHARGE Smart Lamp Speaker on color-changing mode and watch it cycle through all the colors of the rainbow. 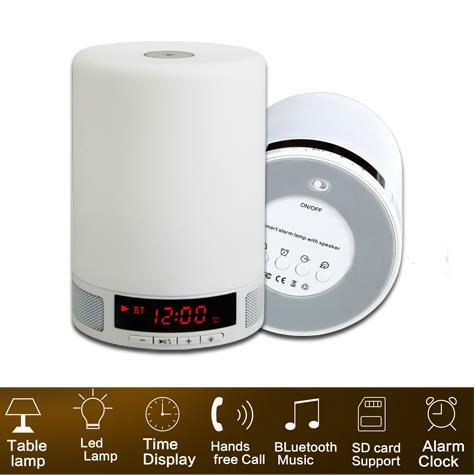 TheLifeCHARGE Smart Lamp Speaker is equipped with smart technology that enables it to detect when it has been dormant for 20 minutes. That that time, it automatically shuts off without aid from you, the user. As a result, you can fall asleep, resting easy that the lamp will extinguish itself without your assistance. 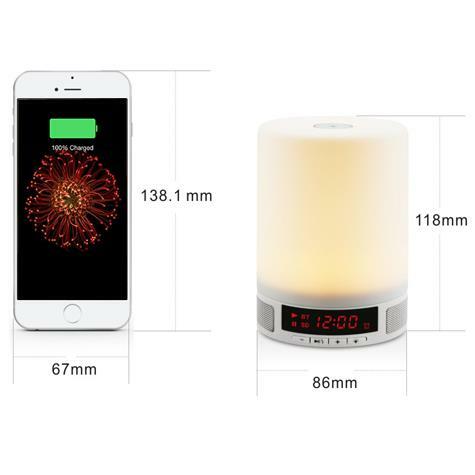 TheLifeCHARGE Smart Lamp Speaker is shorter than the iPhone 6 and just slightly wider at its base, making it ultra-portable and convenient when space is at a premium.